On the touring day, your private tour guide and driver will meet you in hotel lobby at confirmed time. After an 1-hour driving, you will arrive at the Terracotta Warriors and Horses Museum. 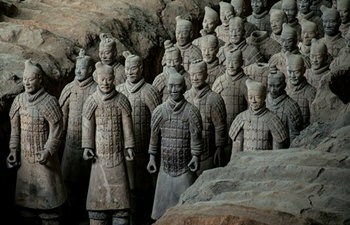 Terracotta Warriors and Horses is known as “the Eighth Wonders of the World” with a surprisingly high level in sculpture. It is located 30 km east of the Xi’an City and the original site was found by four local farmers while drilling a well in 1974. Now it has turned into one of the most important attractions in China and the top attractive sites in Xi’an. The museum includes Pit 1(the largest pit), Pit 2, Pit 3, and the exhibition hall of the chariots and horses. You will stay in the museum for 2-3 hours. After the visit you will be transferred back to your hotel or appointed place in downtown Xi’an. Terracotta Warriors and Horses Museum opens at 08:00 and close at 18:00, so we advise departs hotel earliest at 07:00 and latest at 14:00. Please advise your preferred hotel pickup time. Meal is left to your interest. Our guide will recommend restaurant and dishes according to your requirement. Pickup/drop off location of this tour can also be Xi’an Xianyang International Airport. The extra transfer fee is CNY200 （7 seats van）/CNY350 （17 seats van） per way. If you need the airport pickup/drop off, please inform when booking the tour and advise the flight information. Please top the price difference when you meet the guide.